Chicago Bears edge defender Khalil Mack continued his 2018 dominance in Week 4 against the Tampa Bay Buccaneers. As usual, Mack was unblockable all afternoon, disrupting the game from start to finish and routinely making Tampa’s offensive line look as if they were standing still. The All-Pro recorded a strip-sack in the second quarter and hit Bucs signal-caller Jameis Winston while he was in the throwing motion to give his teammate Danny Trevathan an easy interception. Mack is now the only player in the NFL to record a sack and forced fumble in four consecutive games since former Indianapolis Colts standout edge defender Robert Mathis accomplished the feat in 2005. Mack finished his demolition of the Bucs’ offensive line with four total pressures and two defensive stops, earning a league-high 90.9 overall grade among all edge defenders in Week 4. 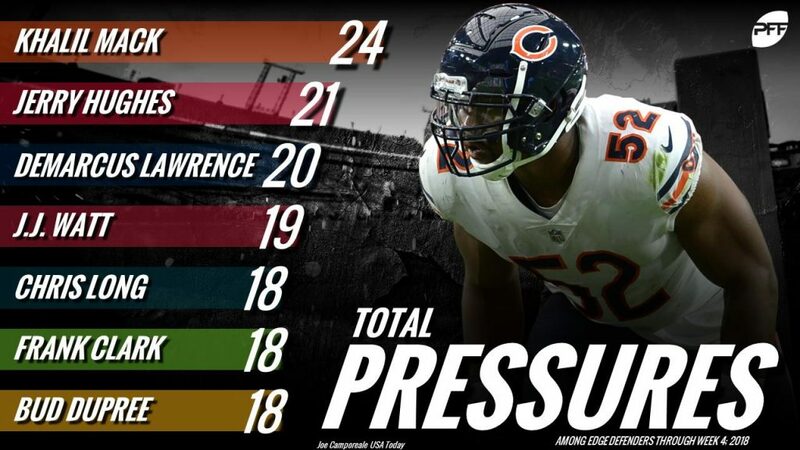 Through the first quarter of the season, Mack leads all edge defenders with 24 total pressures, and his pressure rate of 19.4% ranks second at the position. Mack’s versatility as a pass-rusher has been on full display, with 37.5% of his pressures have come on speed rushes to the outside and 33.4% from bullrushes or moves to the inside. His 24 pressures are now tied for the 13th-most among edge defenders through the first four games of a season in the PFF era (2006-18). He also has six more pressures than he did through the first four weeks of the award-winning 2016 season. Mack has helped turn the Bears’ defensive front into one of the most feared units in the league. The team currently ranks 11th in pressure rate at 35.4%. This is a dramatic improvement from last year, as the Bears finished only 26th-best in pressuring the quarterback at a rate of 32.3% in 2017. This season, the Bears have been particularly great at harassing the quarterback on plays of long third downs (10 or more yards to gain). With the help of Mack in these situations, the defense has generated pressure at a rate of 54.2%, sixth-best. Chicago’s defense has been heading in the right direction for a while now, and the move to acquire Mack from the Oakland Raiders is already paying substantial dividends. The 2016 Defensive Player of the Year is demonstrating the impact of what an elite level player on the edge can do for a defense. Mack currently ranks first among all edge rushers with an overall grade of 92.1, and through his dominance, he’s accelerated the transformation of the Bears’ defense to among the best in the NFL after the first four games of the season.